Sorry I've been so slow with posting this week! 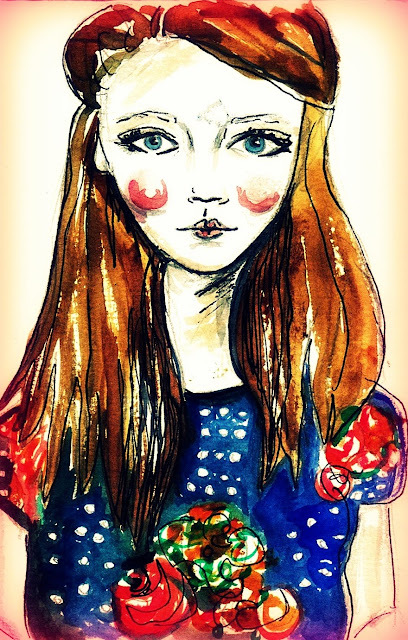 Ashleigh from Classic Fashion Diary asked if I could make an illustration of her, and this is what I came up with. I did it with watercolour and pen; it was actually only a really little drawing but I think it's turned out quite nicely. Very pretty, it looks quite like her now that I've been to her blog. Another one well done, Carly! Keep it up, darlin. I love it, again thankyou! Thank you all! You are so lovely. oh my goodness. you are so talented! these are stunning!!! This is amazing! Your so talented! Gorgeous illustration, love the blue of the dress against the tones of brown in the hair and flowers! These are such amazing illustrations! I'm jealous of your skill and talent. Have a great weekend! So so so lovely. x hivennn p.s enter my giveaway?